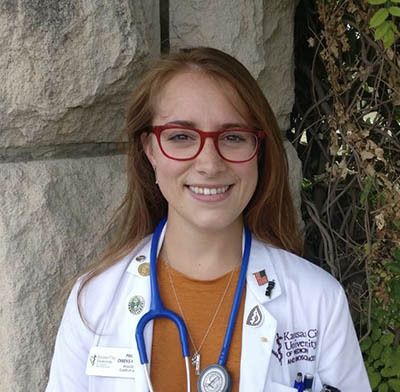 KCU Student Doctor Paige Owens-Kurtz shares her experience with strategic operations training as part of the Military Honors Track. Just north of San Diego in a gated compound, 35 second-year medical students cluster together covered in fake blood. It’s the afternoon of day one, and briefings now required participation. We had just been through our first mass casualty simulation, and from the tone of the doctor lecturing we definitely had some improving to do. But that was the whole point. 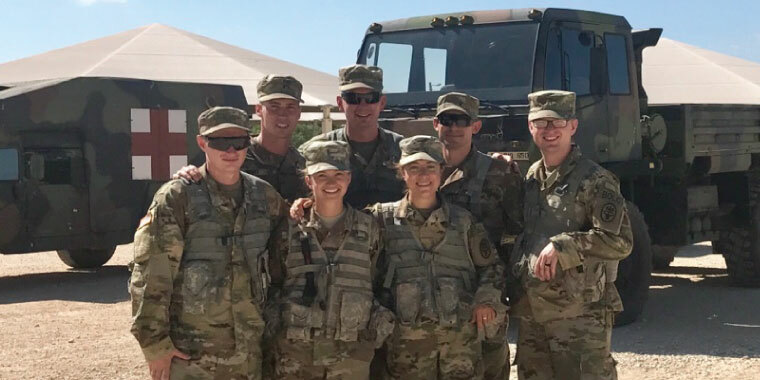 STOPS, short for “Strategic Ops,” is a place unlike any in the country, and the location of the capstone experience for second-year students in the Military Honors track. 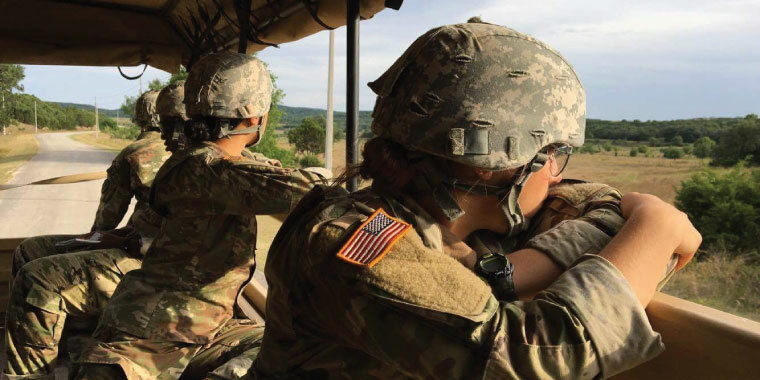 Set in an old movie studio, military tactical and medical teams converge from around the country to train within its walls. For the last two years, we had been practicing clinical skills and now we were to be tested in front of a staggering lineup of retired Generals, Admirals, residency program directors and top physicians in their fields. The word pounding falls flat in trying to describe my heartbeat. That stress has a purpose, and those physicians knew exactly what they were doing. Teaching to failure, pushing students just past what they can realistically achieve, holds immense value in permanent learning, but it is a difficult concept to apply to medicine. To us, failure means harm, something we explicitly avoid, which is why STOPS is such a unique and valuable place. 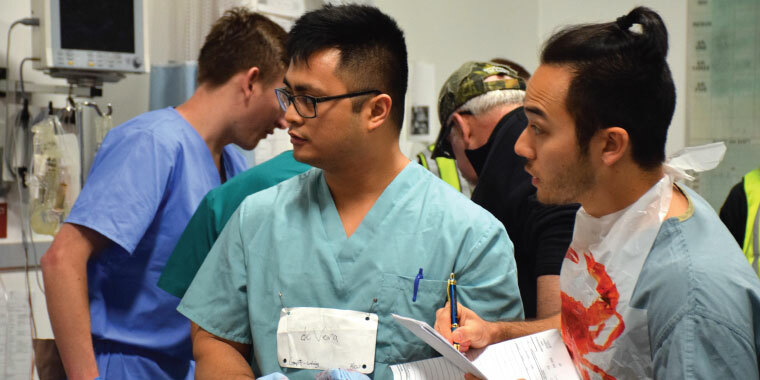 Opportunities for high intensity, hyper-realistic training are limited even for residents, and here we were lucky enough to be immersed for an entire week. This mentality was mirrored in how our instructors interacted with us: “Well I know you don’t know,” the trauma surgeon grinned, gowned arms across her chest, “that’s why I’m grilling you. When you look that up tonight you’ll never forget it.” Another noted, “Check your egos at the door. They have no business here. Egos are what kill people.” Learning from failure is essential to the emotional arc of a medical student, and it was a lesson taught in abundance over the course of our time there. It was in these controlled environments surrounded by world-class teachers that we made our first halting baby steps as clinicians. Therein lies the immense value of high-intensity, hyper-realistic training. We fail now, we see our hands tremble now, because when this happens later and the blood is not cornstarch and food coloring we already know how to work through racing heartbeats. Every single veteran clinician I talked to while there wished they had had this opportunity as a resident. Stress is an inescapable part of life as a military physician, but nobody gives you a practice run. Here was a safe environment to push our limits and find our own sustainable methods of decompressing while being surrounded by inspirational mentors. Beyond the critical inoculation to chaos, STOPS served as a visceral reminder of why we were all dedicating our lives to this cause in the first place – we were here for our future patients, be they in the clinic, the ED, the OR, or the battlefield. Thanks to Devin Maxwell, Tim Kenny, and John Peterson, all HPSP Class of 2020, for sharing their impressions of our experience with me for this article.